Scientists detect billion-year-old gravitational message. This is a view of the LIGO detector in Hanford, Washington. LIGO research is carried out by the LIGO Scientific Collaboration, a group of more than 1000 scientists from universities around the United States and in 14 other countries. (Inside Science) -- Roughly 1.3 billion years ago, around the time multicellular life was starting to spread on Earth, a pair of black holes collided and released a torrent of gravitational energy into the cosmos. Today, physicists announced they had spotted that energy here on Earth. The announcement, coinciding with the publication of a peer-reviewed paper in Physical Review Letters with 1,004 co-authors making up the LIGO Scientific Collaboration, marks the first confirmed detection of gravitational waves, a phenomenon predicted by Albert Einstein a century ago. Einstein’s general relativity equations revealed that accelerating masses should send waves rippling through spacetime at the speed of light. Few if any physicists doubted the waves’ existence, and the 1993 Nobel Prize in Physics was awarded for work that provided strong though indirect evidence for them. But actually detecting them was a monumental challenge. Even a strong gravitational wave passing through Earth disturbs objects only by around one-thousandth the diameter of a proton. Nevertheless, physicists calculated that certain extremely violent events -- massive black holes or neutron stars spiraling into each other, for example -- could release enough gravitational energy to be detected on Earth. In 1992 the National Science Foundation green-lighted LIGO to build two facilities, in Livingston, Louisiana and Hanford, Washington. The detector works by bouncing laser beams between exquisitely polished mirrors positioned at the ends of perpendicular 4-kilometer-long tunnels that form an enormous ‘L’. When the returning beams intersect at the L’s vertex, they interfere with each other and create patterns on a detector screen. If a disturbance were to cause one tunnel to become slightly longer or shorter than the other, the laser interference pattern would change in a way that would reveal information about the source of the disturbance. In the process of building the two detectors, scientists designed some of the most precise mirrors and lenses ever made. Multiple detectors are necessary because local disturbances like a falling tree can jiggle the mirrors, causing false positives. “You can only believe [signals are] real if you see them both at the same time from places that are far apart,” said Gabriela Gonzalez, also at the press conference. She is a physicist at Louisiana State University in Baton Rouge, and spokesperson for the LIGO collaboration. VIRGO, a third detector based in Cascina, Italy, will help scientists better pinpoint gravitational wave sources when it comes online again later this year. Other detectors are being built in Japan and India. 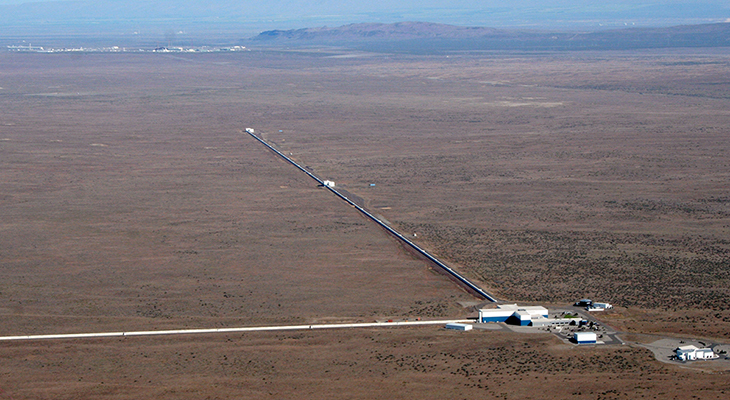 The LIGO detectors operated from 2002 to 2007 and again, along with VIRGO, from 2009 to 2010, but they did not catch a wave during these runs. Project leaders then took them all offline to upgrade them so they could increase their search volume by more than 1,000 times. Rebranded as Advanced LIGO, the experiment came back online last year and, according to today’s announcement, almost immediately both the Livingston and Hanford observatories spotted a signal resembling a gravitational wave from merging black holes. Rumors of a detection began swirling shortly after the September 14, 2015 finding, but project officials remained coy while they analyzed their data to make sure they sure they weren’t fooled by a spurious event or system test. It wasn’t until mid-January that LIGO scientists ruled out other causes and decided by majority vote that they had seen a real event. The black holes LIGO detected were both around 30 times the sun’s mass, and when they merged into one larger black hole, the collision sent out the gravitational energy equivalent to what is contained in three suns. Black holes of that size had been theorized but not observed before. LIGO scientists have long said that the experiment’s main purpose is not to detect gravitational waves, but to do astronomy. Gravitational waves could provide a way to study the universe’s most extreme objects -- extremely dense neutron stars and black holes that are difficult or impossible to study with light.